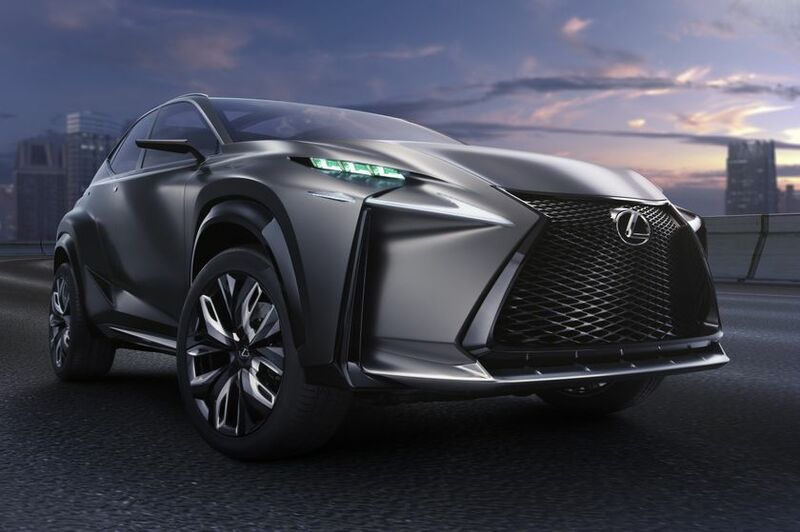 More compact than the pioneering RX at 4,640 mm long with a 2,700 mm wheelbase length, the LF-NX Turbo concept focuses on the growing segment of smaller, more urban-centric compact premium Crossovers. 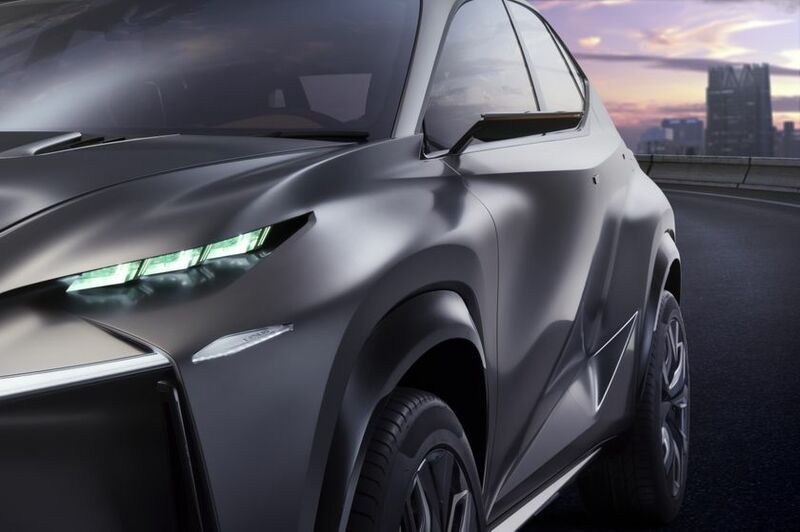 Combining spirited performance with optimum fuel efficiency, the new LF-NX Turbo’s 2.0 litre engine paves the way for the introduction of turbocharged powerplants in future Lexus models. 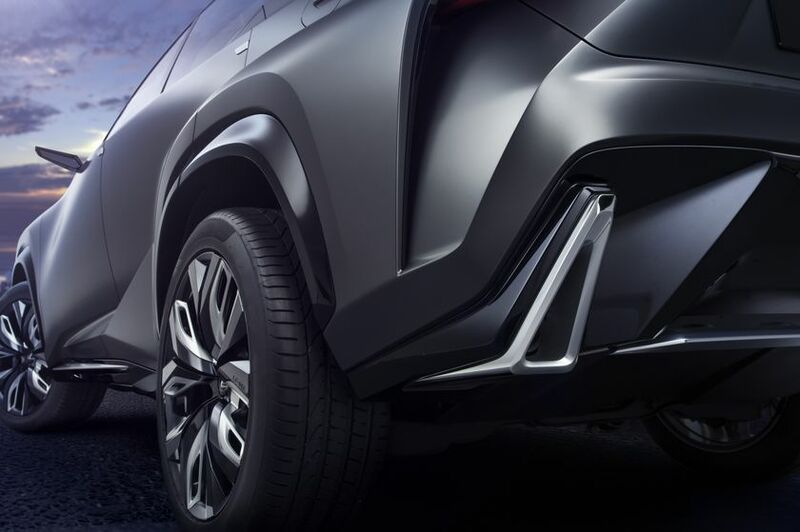 The LF-NX Turbo concept’s bold, striking and innovative exterior reflects a further evolution of Lexus’ L-finesse design language, bringing more distinctive and sculpted styling to the premium compact Crossover segment for the first time. 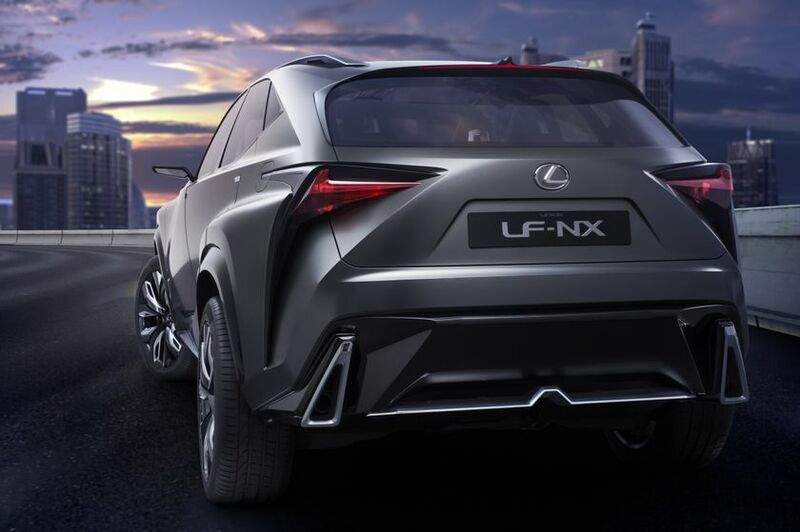 The overall form of the LF-NX Turbo is generated by a powerful, diamond-shaped body which flows from the front grille through the belt line of the vehicle, and prominent fenders, wheel arches and tires which express the muscular stance of a highly agile SUV. 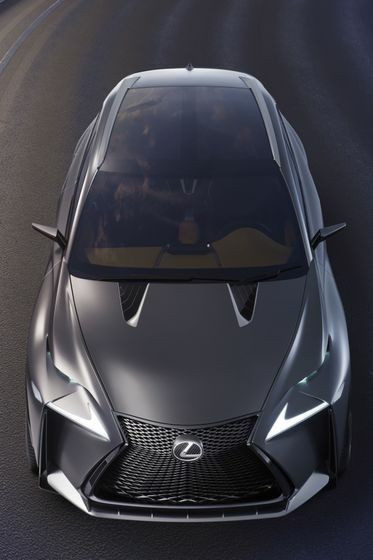 The front of the new concept is dominated by a strong interpretation of the Lexus spindle grille. Both the smoked chrome trim and grille mesh pattern increase in size as the grille widens through the lower bumper area, to accentuate the concept’s wide, powerful stance. The upper edges of the grille generate powerful lines, while the base is underscored by a narrow, black mesh air intake above a sharp, fin-shaped, matt chrome-finished chin spoiler which reinforces the crossover concept’s low centre of gravity and sporting credentials. Extremely expressive, signature front lighting features three diamond-shaped LED headlamps and independent Daytime Running Lights (DRL). The DRLs are underscored by full-length LED strip turn signal lamps. The lower bumper flows away from the spindle grille edges into high-gloss black paint-trimmed vertical air intakes with a black mesh duct finish, before projecting strongly forward into a unique corner detail. This separates the bumper from the front wing with an aggressive vertical cut detail that narrows to a point beneath the headlamp clusters. The front and rear fenders are formed by a series of muscular, concave and convex curves. Both the wheel arches and the lower rocker panel are finished in a high-gloss black painted trim, adding a sporting note to the protective finish which typifies an urban crossover. A fin-shaped upper rocker panel moulding is finished in matt chrome, visually extending the line of the crisp, sporting chin spoiler along the sides of the vehicle. In plan form, the pronounced diamond shape of the belt line reaches its widest point adjacent to the B pillar before narrowing as it flows astern. Below, the door sills generate a more aggressive, angular interpretation of the rising crease line first seen on the LF-CC concept. Above the belt line, the classic Lexus side glazing profile combines with a steeply raked tailgate and integral spoiler to create the sweeping silhouette of an athletic coupe. Both the glazing surrounds and the door mirror upper surface share the smoked chrome finish of the front grille surround. The rear of the LF-NX is dominated by highly articulated lamp clusters which create an instantly identifiable light signature. They extend the full depth of the bumper, creating a sharp, aerodynamic trailing edge detail. The Lexus signature ‘L’ shape of the lamp itself is scored strongly into the rear bodywork, creating an echo of the spindle form theme. Finished in high-gloss black paint, the wide lower bumper is underscored by a sharp, full-width, matte chrome-finished aerodynamic diffuser. It is flanked by highly sculpted chrome exhausts shaped to reflect the aggressive styling of the front wing vertical air intakes. 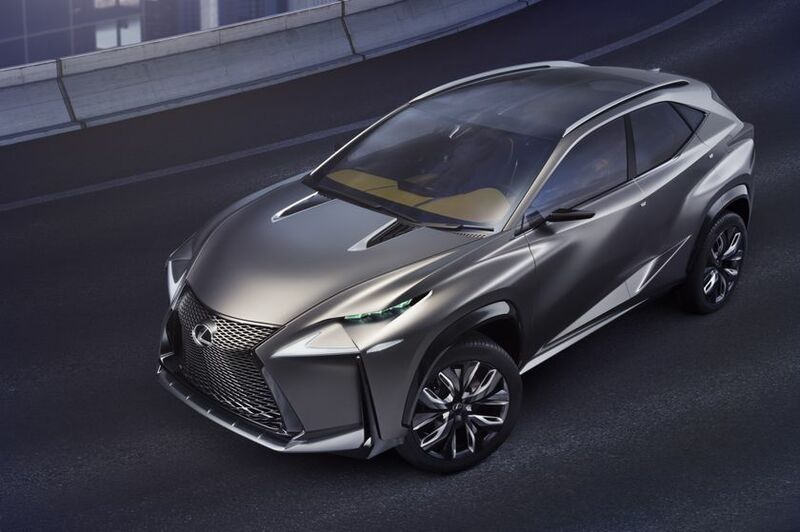 The Lexus LF-NX Turbo concept is finished in a new, Brushed Metal Silver exterior colour which gives the striking impression that the bodyshell has been carved from a single billet of solid metal. A new, more aggressive alloy wheel design and a change in tire size from the HV’s 255 50R 20 to 255 45 ZR 20 give the LF-NX Turbo concept a more sporting appearance and a wide, confident stance. 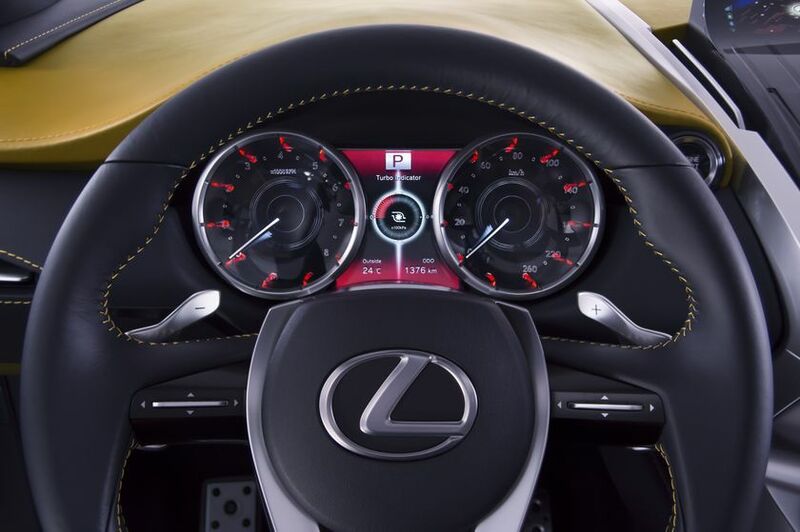 In a continuation of the ‘Human Oriented’ L-finesse design concept realised in both the LFA and new IS, the interior mirrors the LF-NX Turbo’s highly sculpted exterior styling. It features bold, powerful forms which create a driver-focused cockpit within an ergonomically ideal environment. The centre console extends the full length of the cabin to bisect the rear seats. Its highly three-dimensional framework echoes the concept crossover’s spindle grille frontal design. The same sophisticated, sculpted brushed metal finish has also been applied to the driver’s instrument meters, the steering wheel, the seat structure and the overhead console. Reinforcing the LF-NX Turbo concept’s premium SUV credentials, the strength and refinement of this carved metal surfacing is complemented throughout the cabin by Sunrise Yellow and Black leather upholstery with contrast stitching. Intuitive interaction with the vehicle’s switchgear, instrumentation and Human Machine Interface (HMI) technology is at the heart of Lexus interior design. 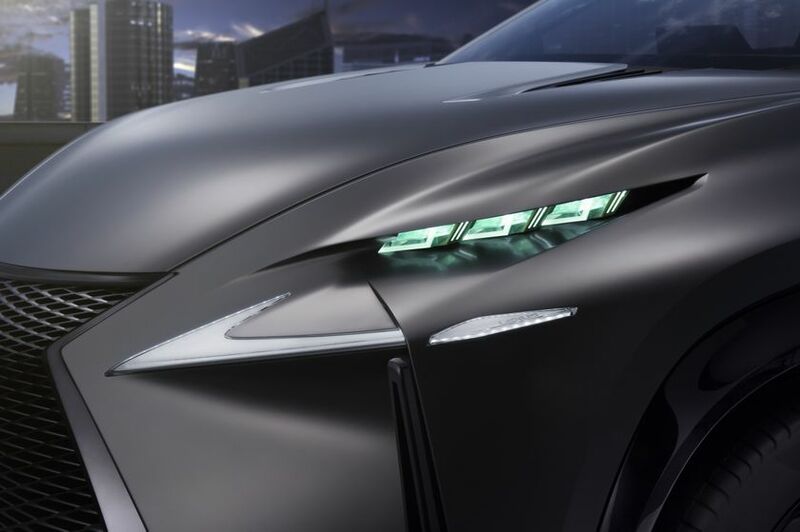 And the LF-NX cabin features the ideal, upper display zone and lower operation zone dashboard format perfected over successive Lexus generations. The upper display zone features an exclusive driver’s instrument meter design. The lower operation zone allows access to a new generation of touch-sensitive, electrostatic switches and the new Lexus Remote Touch Interface (RTI). The RTI combines a modified touch tracer display with a new touch pad design for smooth and intuitive use, and an adjustable arm rest to enhance comfort and ease of use. Reflecting the performance potential of the concept’s 2.0 litre turbocharged powerplant, instrument and switchgear including the meters, navigation screen, RTI touch tracer and touch pad, and the roof and door panels are illuminated in a sporting red. 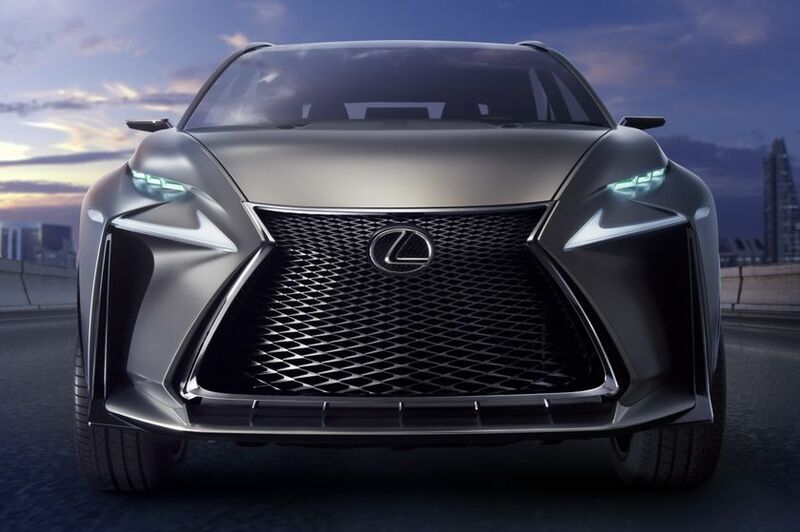 The LF-NX Turbo concept is equipped with Lexus’ first turbocharged gasoline engine. The 2.0 litre, 4-cylinder unit combines Lexus’ advanced high tumble port, fan spray fuel injection, D-4S and VVT-i combustion technologies with a cylinder head-integrated exhaust manifold and a twin scroll turbocharger with an active wastegate valve. Through optimisation of the exhaust gas temperature, the cylinder head-integrated exhaust manifold combines a high level of performance with fuel efficiency, clean exhaust emission reliability, while the twin scroll turbocharger operates effectively across the widest possible rev range. The LF-NX Turbo’s new powerplant targets a fast throttle response and exhilarating performance while demonstrating outstanding fuel efficiency.